Damage to collectibles can be caused by uncontrolled temperature and relative humidity, dust and dirt, and gaseous pollutants such as ozone and sulphur dioxide. Temperature and humidity, if not controlled properly, can speed up the rate of chemical reactions which cause much of the deterioration of sensitive objects. Dust and dirt contamination can cause artefacts to discolour and can potentially scratch precious gems; whereas, gaseous pollutants may cause significant and irreversible deterioration of artefacts, metals, historic records, photographs, and marble through chemical reactions. Poor Indoor Air Quality (IAQ) can also have adverse health effects on employees and visitors. 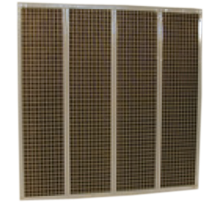 Rainbow Filters can custom design air filtration products to meet the most demanding airflow and efficiency requirements and provide critically controlled environments with regards to temperature, humidity, and air purification in any museum or historic preservation setting.